The dictionary people should just take my advice and call them ”magic chance cubes of mystical fate”. Problem solved. Weird, being Swedish, I’ve only played the Swedish version in which a small straight is 1-2-3-4-5 and a large straight is 2-3-4-5-6. I was going to correct you on that at first, but hesitated a bit for fear of getting -1000000 points (wasn’t sure if that only applied to grammar corrections or all kinds of nit-picking). Anyway, a quick trip to Wikipedia taught me about rule variations in different countries. Not sure why I’m writing about all this here, I just felt like it. A small straight is only 4 dice. (And since there are five dice in Yahtzee, he’s still correct). 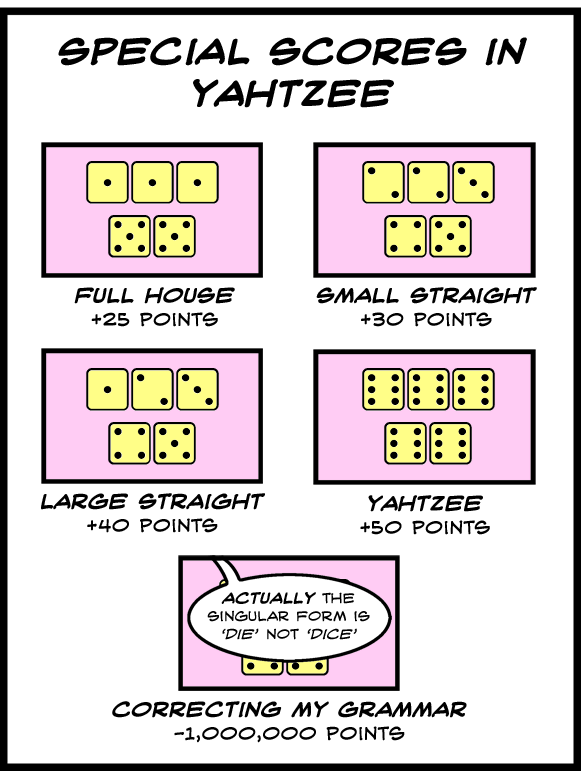 I’ve never ever played Yahtzee and would like to one day. Do it today, it doesn’t even require someone else, you can play against yourself. I always wish those people dice. I always thought the word dice should be interchangeable between singular and plural anyway. After all, die can mean too many other things (Okay, just one, but it’s a biggie). And we have the word dices. Although I tend to say 1d6 instead. But “they” is nice because there isn’t another word for that! Anyway, my brain goes on strike for a few minutes anytime my ears tell it that someone said “dice” for singular. Do you know how hard it is to read hilarious comics without a brain?